The story is about a grumpy old man living in a haunted house. A boy at the other side of the street observed the house for a while and tries to convince other people that the house does actually live. Obviously nobody believes him, odd isn’t it? Anyway with the help of a friend and a girl, they just met, they are going to investigate the house and unravel its mystery, which I won’t reveal here. The film is a 3D animation created using mocap which has resulted in amazingly realistic animations. The way the characters move is very lifelike even though the characters themselves are caricatures. The animation is quite polished. There is a lot of humor in the movie. 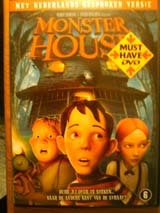 The horror aspect should of course be taken with a grain of salt, at least for adults. if you like 3D animated movies then this is certainly one I can recommend. This entry was posted on Saturday, August 29th, 2009 at 13:07	and is filed under Movies. You can follow any responses to this entry through the RSS 2.0 feed. You can leave a response, or trackback from your own site.